KAY Painter has a pair of pink baby shoes that she keeps in a safe spot in her home in Idaho, United States. They are a reminder of a daughter the international best-selling author never got to hold in her arms because of an abortion. 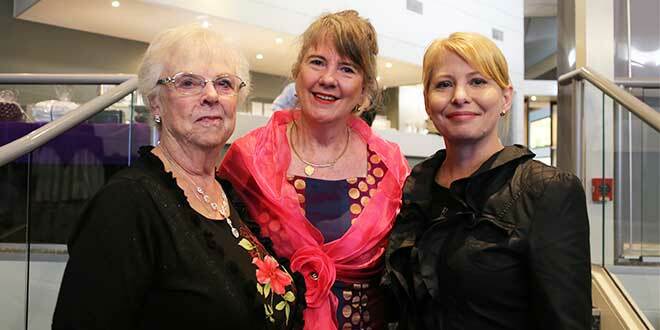 Speaking at the annual Cherish Life Dinner on October 20 during her ninth trip to Australia in 10 years, Ms Painter said the pair of booties was meant for her daughter Sara. “I have this set of baby shoes, they’re pink, sparkly, shiny,” Ms Painter said at the dinner. The founder of Remembering SARA, a post-abortion grief ministry, said she was lied to about the effects of the abortion, which she had at 39 years of age. She recalled the doctors telling her the procedure would remove “the tissue” from her body, and withheld the fact she was five months pregnant at the time of her abortion. The wake-up call was the “thud” of her baby’s body as it landed in the garbage. “The doctor walked past the head of the bed, threw my baby’s body into the garbage and it let out a great ‘thud’ as it hit the bottom,” Ms Painter said. The regret of her abortion haunted her for 16 years, to the point where she attempted suicide twice. It wasn’t until she met an “old pastor in a country church who recognised my need for Jesus” that she began the healing process. Ms Painter said her story was not unique, and that many women in the pro-choice movement were deeply hurting inside. “There’s a reason they throw rocks and spit at us,” she said. Victorian Democratic Labor Party member Dr Rachel Carling-Jenkins, the Cherish Life dinner’s keynote speaker, said she had been on the receiving end from pro-abortion groups. After watching a violent protester rip a poster out of an elderly woman’s hand at the 2013 March for the Babies in Melbourne, she decided to “stand up” to be a Member of Parliament. In October 2015, Dr Carling-Jenkins introduced the Infant Viability Bill into the Victorian Parliament, the first piece of pro-life law since the state decriminalised abortion. She offered her difficult journey of trying to roll back the state’s drastic abortion laws as encouragement to her “home state” Queensland, which is awaiting a committee report into a second bill to legalise abortion. “Abortion arises out of the lack of choice,” Dr Carling-Jenkins said at the dinner. “I am pro-life from conception until natural birth. “If I had my way, we would have no abortions. Dr Carling-Jenkins’ bill would have made abortions after 24 weeks’ gestation illegal and introduce a definition of abortion as killing an unborn child. But the bill failed to pass through parliament, with only 11 out of Victoria’s 40 Legislative Council members voting to make it legislation. The former Queenslander said she was offered bribes to pull the bill from parliament. “I was offered bribes to take the bill off the table and not have the debate,” Dr Carling-Jenkins said. Dr Carling-Jenkins said the growing support for the assisted-dying bill was “a threat” to the pro-life movement, and in particular, changing abortion laws. She said legalising euthanasia in Victoria would make way for infanticide, which would make it legal to have a “post-birth abortion” during the fourth-trimester, or three months after birth. “Clearly Victorian parliament is not supporting the people,” Dr Carling-Jenkins said. “They are forgetting the pro-life votes.